Oct. 27, 2009 · 11:22 p.m.
A notice of an emergency meeting by the Willow Run Board of Education was sent out this evening. With two items to discuss scheduled after a closed session for the proposed Wednesday night meeting, it appears Superintendent Doris Hope-Jackson may be leaving the district. The first item on the agenda after the closed "executive session," is the appointment of an acting superintendent. The second item on the agenda is the acceptance of a resignation. 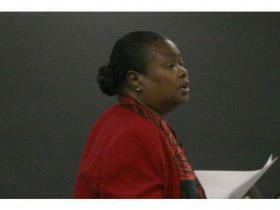 The Citizen received the agenda from Board President Sheri Washington at 7:45 p.m. Tuesday. The Citizen will follow up on the notice, and update this story as soon as information becomes available. Jackson had already submitted her resignation once before in May. She then rescinded her resignation a few days later.